Thank you for the opportunity to speak to you today about dynamic analysis of the Tax Reform Act of 2014. Just a brief background on the Tax Foundation. We were founded in 1937 and are the nation’s oldest organization dedicated to promoting economically sound tax policy at the federal, state, and local levels of government. We are a nonpartisan 501(c)(3) organization. For 77 years, the Tax Foundation’s research has been guided by the immutable principles of sound tax policy which say that taxes should be neutral to economic decision making; they should be simple, transparent, and stable; and they should not hinder economic growth. All of these are good reasons to reform our tax code, but economic growth ought to be the primary objective. While we all may want a simple and more equitable tax code, if such a tax code actually slows economic growth and lowers living standards, then we should reconsider those policies. And this is why dynamic analysis must be an essential tool of any effort to reform the tax code. As we’ll see, there are many base broadeners that seem a reasonable tradeoff for lower rates when measured on a conventional basis, but are actually anti-growth when measured on a dynamic basis. Indeed, the biggest obstacle to crafting pro-growth tax reform is the strict adherence to the constraint of revenue neutrality measured on a conventional static basis. In order to do tax reform right, members should not have to wait for a dynamic analysis of the final tax reform plan, they should be provided a dynamic analysis of each component of the plan as it is being constructed. Only then, will members know which components maximize growth and which slow growth. However, economic growth should not be an accidental outcome of the process, it should be initial goal of the process. Before even beginning to think about how to reform the tax code, lawmakers should set out a target for how much additional economic growth they hope to achieve as the result of the tax overhaul. Any policy that subtracts from that goal should be replaced with policies that move closer to the goal. Chairman Camp deserves a lot of credit for undertaking the Herculean task of drafting a comprehensive tax reform plan. The Chairman’s plan has many positive features that, by themselves, would promote growth and competitiveness. 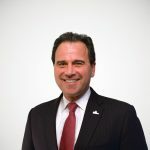 Chief among these are the reduction in the corporate tax rate to 25 percent, the cut in the individual income tax rates to 10 percent and 25 percent, and the elimination of the corporate and individual AMTs. When we modeled these policies in isolation with no offsets, we found that they would boost GDP by 4.74 percent, increase the capital stock by 11.5 percent, after-tax incomes by 7.57 percent, and the number of full-time equivalent jobs by 5.2 million. We also found that these rate cuts lost less revenues when measured dynamically—within the ten-year budget window the corporate rate cut would be 59 percent less costly and the individual rate cuts would be 21 percent less costly. (The corporate rate cut pays for itself in the long run.) This means that the tax reform plan would have required fewer offsets had members been provided this information at the beginning of the process. However, we find that many of the offsets that were required to keep the Chairman’s draft both revenue and distributionally neutral on a static basis had the effect of dampening the growth potential for the plan. We modeled the economic effects of the Chairman’s draft using our Taxes and Growth Dynamic Tax Model. The model is known in economics jargon as a Neoclassical open-economy growth model, which means that the results are driven by tax changes to the cost of capital and the cost of labor. The model allows us to simulate how tax changes will affect key measures, such as the level of long-term GDP, private investment, wages and jobs, and federal tax revenues (both dynamically and statically). It is an excellent tool for understanding the economic effects of tax policy. Overall, we found that the domestic provisions of the reform plan would increase GDP by 0.22 percent over the long run, which is on the low end of the dynamic estimates produced by the Joint Committee on Taxation. Additionally, the plan would raise the cost of capital in a variety of ways which would reduce the capital stock by a modest 0.18 percent. And due to the reduction in the size of the capital stock, the plan would slightly decrease pre-tax wages by 0.21 percent. However, because the plan reduces marginal taxes on labor income it would raise after-tax wages slightly and that, in turn, would encourage more labor force participation and hours worked—equivalent to adding about 486,000 full-time jobs. What this means, though, is that people would be working longer but producing less total output with less capital. I should point out that ours was not the only analysis of the Camp draft to determine that the plan would raise the cost of capital. The dynamic analyses performed by the Joint Committee on Taxation and the BRT’s analysis performed by John Diamond and George Zodrow found similar results to different degrees. For example, in Simulation 2, our model shows that the Camp draft with no other change except for maintaining the current MACRS depreciation system—as opposed to the ADS system outlined in the draft—would boost GDP by 1.31 percent over the long run, the capital stock by 2.95 percent, wages by 0.71 percent, and create 685,000 full-time equivalent jobs. Alternately, in Simulation 3 we modeled the plan with a 50 percent exclusion for capital gains and dividends—as opposed to the draft’s 40 percent exclusion. The model shows that this version of the draft would lift GDP by 1.62, the capital stock by 3.85 percent, wages by 0.96 percent, and create 751,000 full-time equivalent jobs. We then paired these two policies together in Simulation 4. The model shows that such a plan would increase GDP by 2.74 percent, the capital stock by 7.14 percent, wages by 1.90 percent, and create nearly 1 million new full-time equivalent jobs. 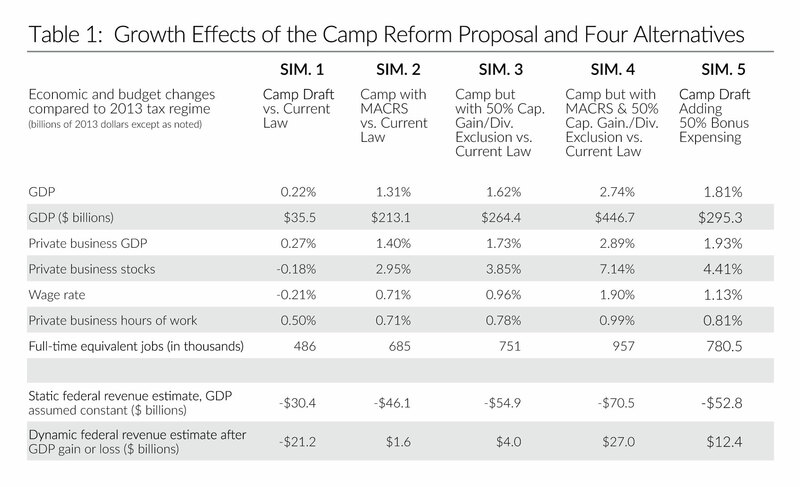 Finally, in Simulation 5, we modeled the original Camp draft with 50 percent bonus expensing and found that such a plan would increase GDP by 1.81 percent, the capital stock by 4.41 percent, the wage rate by 0.86 percent, and create 780,500 full-time equivalent jobs. What these simulations tell us is that the growth potential of the plan could be substantially improved by removing certain provisions that raise the cost of capital, such as the shift to ADS, or expanding provisions that lower the cost of capital, such as increasing the exclusion of capital gains and dividend income or moving closer toward full-expensing of capital purchases. Also note that each of these alternate simulations would raise revenues on a dynamic basis and cost less than the original Camp plan. Scored on this basis would have made it much easier to achieve revenue neutrality, which would have required less base broadening. What Are the Economic Effects of a Fundamental Tax Reform Plan? As a thought experiment, we modeled a more fundamental reform plan that would eliminate all of the income tax biases against saving and investment. Most fundamental tax reforms are economically the same in that they tend to levy only one layer of taxation. Examples of fundamental reforms include the personal expenditure tax or other “saving-consumption neutral” tax systems, such as an individual cash flow tax (a tax on income less saving, that is, on personal consumption expenditures), the Flat Tax, a national sales tax, or a VAT. Generally, a neutral reform plan would adopt full expensing of investment in plant, equipment, and structures, defer tax on all saving, not just in retirement plans, end the double taxation of C corporation income, and eliminate the estate and gift taxes. We modeled a personal expenditure tax, which has a similar economic effect to each of the comprehensive plans previously listed. A 14 percent rate “personal expenditure tax” would lift GDP by nearly 12 percent and would be close to revenue neutral on a static basis. It would increase revenues on a dynamic basis, after growth, by about $236 billion (annual rate). It would raise hours worked by the equivalent of about 4.9 million full-time jobs. At an 11.5 percent rate, a “personal expenditure tax” would lift GDP by almost 15 percent and be roughly revenue neutral on a dynamic basis, after economic growth. It would create the equivalent of 6.5 million full-time jobs. Each of these options would benefit the public enormously at no cost to the government. A win-win situation for everyone. Chairman Camp deserves credit for introducing dynamic macroeconomic analysis into the tax reform debate by requesting a dynamic analysis of the plan from the Joint Committee on Taxation. To our knowledge, this is one of the most comprehensive plans that the JCT has scored on a dynamic basis and its economists should be commended for undertaking such a task. The JCT’s dynamic scoring of the Camp draft provides many useful insights into the workings of JCT’s models and the economic effects of the plan. However, the JCT invites criticism of its work because of the opaque way in which it presents its results and its lack of transparency in documenting how it produces the results that it does. To be fair, JCT does provide a general description of their models and the basic parameters of the models. But, they provide very little documentation of their assumptions, which calculations are performed inside the model and outside of the model, and how they achieve specific results. What is the tax burden on pass-throughs? One of the biggest controversies over the Camp draft was how much it shifted the tax burden from the business sector to individuals and how much it increased the tax burden on pass-through businesses. According to the JCT, the plan amounted to a $590 billion tax reduction for individuals, “not including revenues due to broadening the taxable base of pass-through businesses.” The Tax Foundation asked the JCT for a net figure on changes in the tax burden on pass-throughs and was told that figure was not available. What are the effects of the lower corporate rates on income-shifting? According to JCT, the lower corporate tax rates should have two effects: Encourage U.S. multinationals to shift more income back to the US; and, attract more foreign direct investment (FDI) into the US. From what Tax Foundation economists can surmise, the resulting income shifting had a bigger effect on tax revenues than economic growth. But JCT provides few hints as to how they made these calculations or what the specific results were. Similarly, certain Subpart F changes in the Camp draft are said to encourage U.S. firms to relocate assets such as patents back to the U.S. Again, it is unclear how JCT accounted for these changes. By contrast, in a December 2013 dynamic analysis of Britain’s corporate tax reforms, HM Revenue & Customs (HMRC) and HM Treasury did account for the added effects of increased FDI from the corporate rate cuts, but did so outside of their general equilibrium model. Unlike JCT, the HMRC and HM Treasury report documents how these calculations were made outside of the model, what assumptions were used, and what effect these results had on the base results of their model. What happens beyond the ten-year window? JCT limits the display of the results of their model to what occurs within the ten-year budget window even though the full effects of any tax reform plan happen beyond this arbitrary time period. JCT’s models showed that the growth effects of the plan were less in the second half of the budget window than in the first half. The question is, what happens to growth after the budget window when all of the economic adjustments from the plan’s policies have occurred? Tax Foundation economists asked the JCT if they had results for the end of the transition period beyond the budget window. They were told that all the information that was available was contained in its published report. If members are to have any confidence that JCT’s estimates are accurate and that it is using state of the art tools, then JCT must allow outside economists access to their models for peer review—as they did in their 1997 and 2001 review panels. JCT has made substantial changes to their models over the past decade and it is time they subjected those changes—and the core models—to a review by experts in the field. Transparency is the key to removing the image that JCT is operating a black box and the key to members of Congress getting reality-based analysis. We are happy to let people get under the hood of the Tax Foundation’s Taxes and Growth Model. We will give you a demonstration and let you see the underlying data and functions. We’ve posted the details of our model on our website so that other economists have access to the equations, assumptions, and data that form the basis of our model. Overly complex models are of limited use to lawmakers. It should be possible to easily enter the proposed changes in tax parameters, and to quickly run the models while lawmakers are debating them in a hearing room. For example, the Tax Foundation’s Taxes and Growth Model fits on a laptop and can handle hundreds of types of changes in a matter of minutes. Questions could be answered in real time during a committee markup—at least in rough terms. Most critically, there should be a clear presentation of how tax changes affect the price of key economic factors—especially the price of capital and labor. And any distributional tables should include the economic effect of any tax changes on pre-tax incomes. The models should be transparent, easy to use, and understand. They should be testable and subject to peer review, because if they are not shown to produce realistic outcomes, they will not and should not be trusted. They should be tools for designing tax legislation and working on the federal budget. They should be made available to members of Congress and their staffs, researchers, students, the media, and any members of the public aspiring to policy wonk status. They should be helpful tools for teaching the economics of how taxes and spending affect growth. There is a general perception that dynamic scoring is just a smokescreen for cutting taxes without paying for them. That’s a fair criticism because some politicians and advocates have oversold dynamic scoring as a cure for everything that ails Washington. What dynamic scoring is really about is accuracy, credibility, and having tools that guide us toward tax policies that promote economic growth and steer us away from policies that reduce living standards. Relying on static scoring turns tax reform into an exercise in arithmetic, rather than an exercise in promoting economic growth. Ultimately, conventional static analysis leaves lawmakers in the dark about the economic consequences of their tax choices. That is economic malpractice. And it makes the process about what is good for government, not what policies raise peoples’ living standards and the health of the private economy. Thank you Mr. Chairman. I’m happy to answer any questions that you may have. Scott Hodge, Stephen Entin, & Michael Schuyler, Using Dynamic Analysis Makes Tax Reform 30 Percent Less Challenging, Tax Foundation Special Report No. 210 (Aug. 26, 2013), https://taxfoundation.org/article/using-dynamic-analysis-makes-tax-reform-30-percent-less-challenging. For more detail on the Tax Foundation’s Taxes and Growth Model, see Michael Schuyler, The Taxes and Growth Model—A Brief Overview, Tax Foundation Fiscal Fact No. 429 (May 6, 2014), https://taxfoundation.org/article/taxes-and-growth-model-brief-overview. See also Tax Foundation, The Tax Foundation’s Small Comparative Statics Model of the U.S. Economy, https://taxfoundation.org/tax-foundation-small-comparative-statics-model-us-economy. Stephen Entin, Michael Schuyler, & William McBride, An Economic Analysis of the Camp Tax Reform Discussion Draft, Tax Foundation Special Report No. 219 (May 14, 2014) at 6, https://taxfoundation.org/article/economic-analysis-camp-tax-reform-discussion-draft. Joint Committee on Taxation, Macroeconomic Analysis of the “Tax Reform Act of 2014”, JCX-22-14 (Feb. 26, 2014) at 15, https://www.jct.gov/publications.html?func=download&id=4564&chk=4564&no_html=1. Stephen J. Entin & Michael Schuyler, Adding Bonus Expensing to the Camp Tax Reform Plan, Tax Foundation Fiscal Fact No. 435 (July 7, 2014), https://taxfoundation.org/article/adding-bonus-expensing-camp-tax-reform-plan. HM Revenue and Customs, Analysis of the Dynamic Effects of Corporation Tax Reductions (Dec. 5, 2013) at 27, https://www.gov.uk/government/uploads/system/uploads/attachment_data/file/263560/4069_CT_Dynamic_effects_paper_20130312_IW_v2.pdf.